You can't get these from any of the bookshops. You have to buy Sunday Times Newspaper and pay extra 2 bucks to get one of these books. One week once and there's 6 to collect. After knowing from the TV ad that Sunday Times have this promotion, I feel like getting it each week! But knowing that I don't really read the papers.. and I had to drive out to buy on a Sunday morning.. yea.. everybody should know that I won't make it. 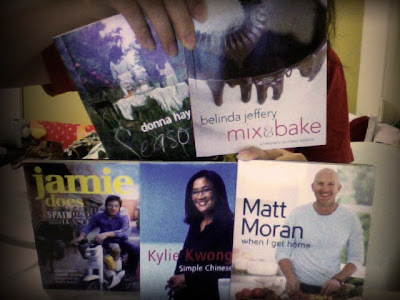 Today, Alice surprised me by giving 5 of the mini cookbooks from Sunday Times to me! (The last one will be this Sunday.) Honestly I was shock and overjoyed. How did she knows that I want the books? How did she collect it for me? Did she buy the papers every week and pay extra 2 bucks each time to get the books just for me? Yes she did! I know it's just a $2 dollar book. But it really touches my heart.. I know she works in the supermarket like I do last time, it's convenient to get (and I know she doesn't read newspaper too but she still get it for me..), but you know.. it's the thought that counts. I would keep the books for myself if I buy them! I don't think I will even think of giving them away! :P ahahaha I know I'm a hoarder.